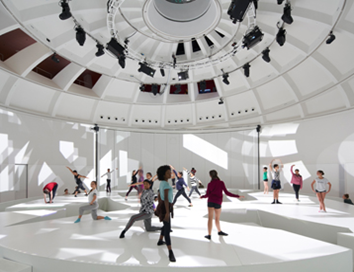 Faena Forum is a 43,000-square-foot facility designed as a public cultural center for large performance and art gatherings. The focal point of the structure is the upper assembly hall that will house art programs and private events. The hall is crowned with a 40-foot-high dome with a center oculus. McClure Engineering Company and Radius Track Corporation designed this dome structure with radiused cold-formed steel. 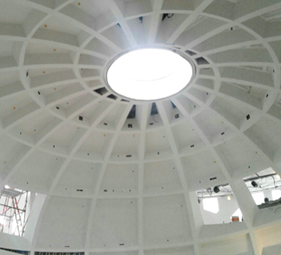 Originally specified as concrete, the 70-foot-diameter spiral coffered dome is the key design element of the space. After completion of the concrete building shell, a fire code issue concerning the sprinkler system threatened to compromise the original design intent. The first alternate design for the dome included a steel structure with fiberglass coffers, which was rejected. Faced with a nine-week schedule, the framing and drywall contractor engaged Radius Track Corporation working with McClure Engineering Company for their combined framing design expertise and precision fabrication capabilities. The shift from concrete to light-gauge framing construction snowballed into a blizzard of design-build challenges that the framing and drywall contractor met head-on and championed so deftly that nothing was sacrificed in the end. The dome required finishing on both sides, a two-hour fire rating, and had to fit into space initially designed for a concrete-formed dome. This meant all the cold-formed primary structural framing had to be streamlined and wrapped in three layers of gypsum wallboard. McClure Engineering Company and Radius Track Corporation suggested a radiused cold-formed truss system, which met fire codes and was approved. The dome structure had to support dead load of materials: 10 psf superimposed dead load, 20 psf live load, and 2,000 lb. event load at each truss. 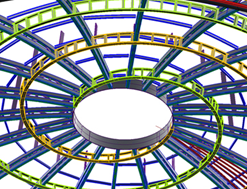 Radius Track designers modeled the entire dome in Rhino, a surface modeling software. McClure Engineering then used the precise surface model to construct a RISA 3-D analysis of the cold-formed trusses, connections, compression ring, and other elements. The truss top and bottom chords consist of two radiused stud/track assemblies (track capped over stud to form a box) with a stud/track box assembly on each side of the web member. Web members are ¾-inch x 3-inch tubes. Webs and chords are fastened with traditional self-tapping screws. The thrust from each truss is carried to the concrete structure or steel beams. A 7/16-inch compression ring frames the oculus at the top. Structural cold-formed chord members are radiused with a series of crimps using proprietary technology developed by Radius Track. These technically “failed sections” were designed by McClure Engineering using testing data and “derating factors” for both strength and deflection. Derating factors for particular members vary depending on member gage, depth, crimp tension/compression, etc. Dome construction progressed within the limited space of the concrete shell. Fabrication of each box-beam truss utilized digital laser scans to fit each assembly to unique site conditions originally prepared for a concrete dome. Once delivered, trusses entered the building through large window openings. The contractor installed each 35-foot-long truss with chain hoists, scaffolds and cranes to precise locations flush to the compression ring using laser levels and measured points on each truss. 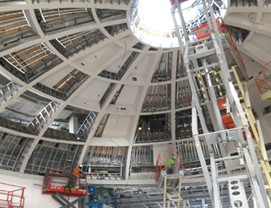 With all trusses in place and drywall wrapped, preformed purlin and hat-channel installation commenced, followed by the compound curved spiral framing. Unlike other domes, this one required finish work on both sides and at punched openings where guests could view performances from above. The unique geometry created by the two nautilus spirals originating at the oculus and terminating at the dome’s base required finish materials for each coffer or opening to be custom cut and fit. At each step of the way, the contractor worked closely with project team members and consultants to meet firm design parameters using different methods and materials than originally specified. 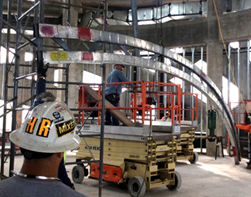 The project utilizes curved/radiused structural cold-formed steel studs. These studs are crimped “failed” at incremental distances to achieve a radius. The design stretches beyond the parameters of current AISI codes and standards. It is the result of years of collaboration, testing, review and cold-formed experience between McClure Engineering Company and Radius Track Corporation. Cold-formed dome structures can compete with radiused structural steel and concrete as well as provide more open architectural solutions. Modeling and fabrication of radiused cold-formed steel can provide an accurate, economical, and versatile solution for high-end architectural surfaces. The project is architecturally unique, showcasing the versatility of cold-formed steel design on an international level.